population inversion factor are determined and plotted against the electron density. in the hope of developing high-efficiency X-ray laser. gain has been predicted and observed by Goldstein et al. tron-impact transitions between all levels. plasma temperatures and plasma electron densities. 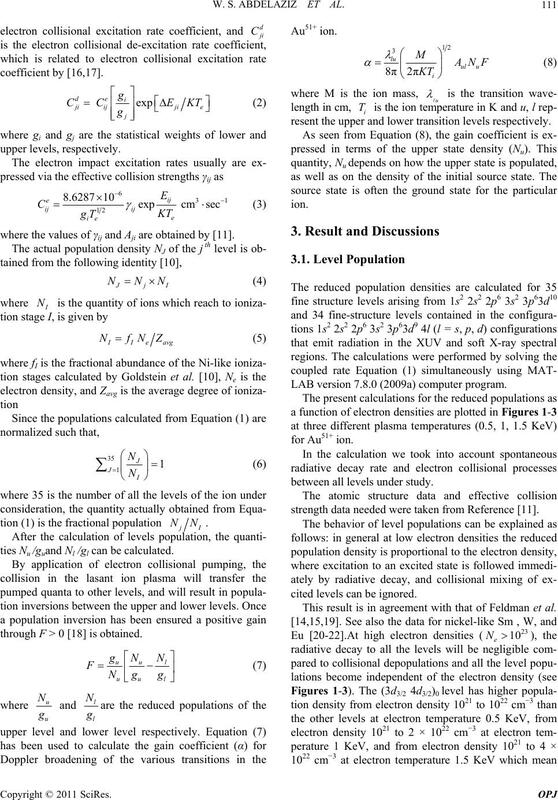 solving the coupled rate equations [12-15]. where the values of γij and Aji are obtained by . ties Nu /guand Nl /gl can be calculated. through F > 0  is obtained. resent the upper and lower transition levels respectively. LAB version 7.8.0 (2009a) computer program. between all levels under study. strength data needed were taken from Reference . cited levels can be ignored. This result is in agreement with that of Feldman et al. 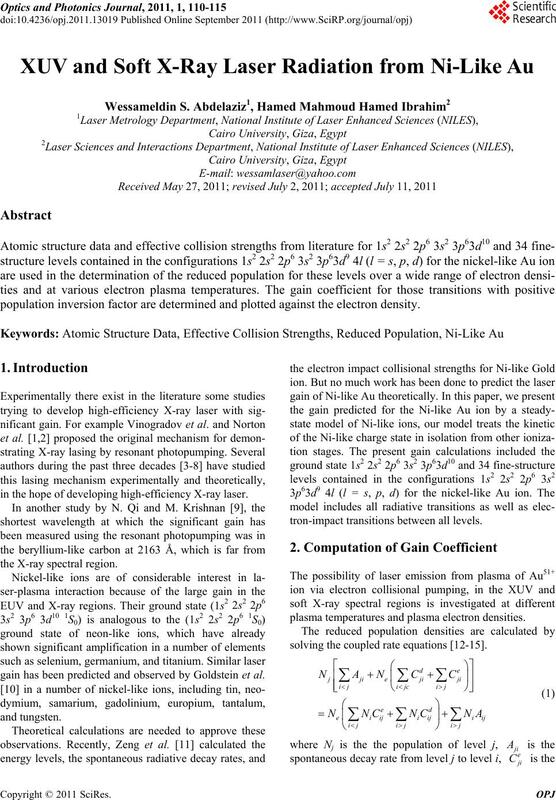 W. S. ABDELAZIZ ET AL. density at temperature 0.5 KeV. density at temperature 1.0 KeV. density at temperature 1.5 KeV. sity than the in the case of Gd-like nickel. Figure 4. 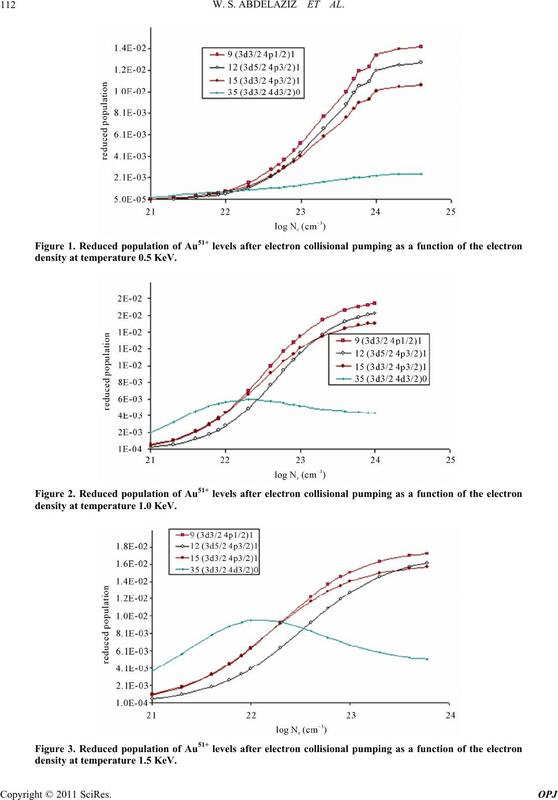 Gain coefficient of possible laser transitions against electron density at temperature 0.5 KeV in Au51+. Figure 5. 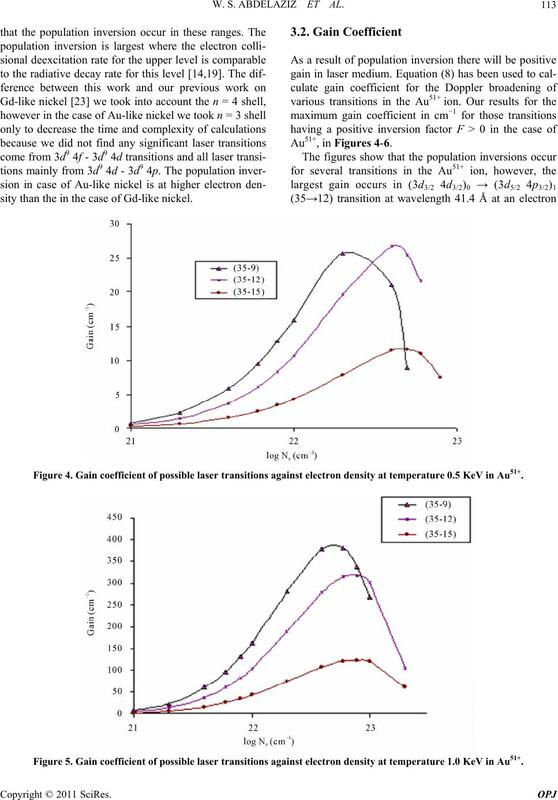 Gain coefficient of possible laser transitions against electron density at temperature 1.0 KeV in Au51+. Figure 6. 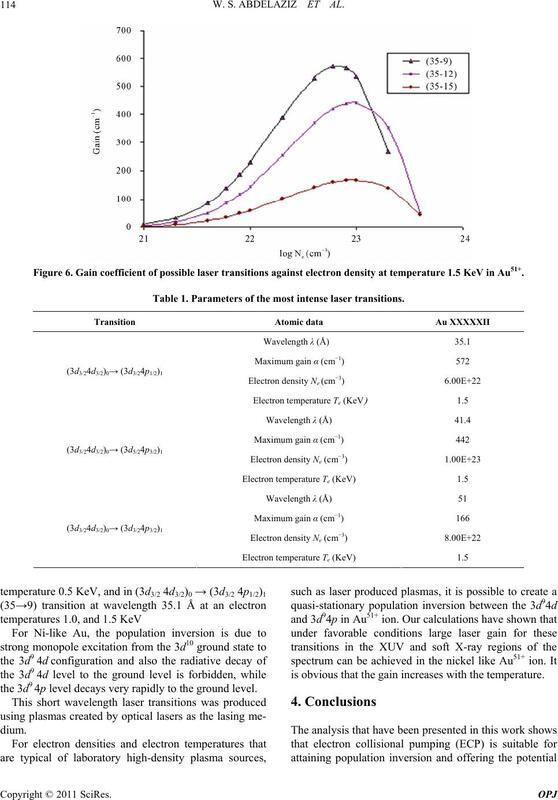 Gain coefficient of possible laser transitions against electron density at temperature 1.5 KeV in Au51+. Table 1. Parameters of the most intense laser transitions. the 3d9 4p level decays very rapidly to the ground level. is obvious that the gain increases with the temperature. ous Plasma,” Soviet Journal of Quantum Electronics, Vol. 5, No. 1, 1975, p. 59. P. Monier, C. Chenais-Popovics, J. P. Geindre and J. C.
A, Vol. 38, 1988, pp. 2508-2515. Vol. 66, 1991, pp. 305-308. J. L. Porter, R. B. Spielman, M. K. Matzen, E. J.
McGuire, L. E. Ruggles, M. F. Vargas, J. P. Apruzese, R.
ters, Vol. 68, 1992, p. 796. Vol. 24, No. 12, 1992, pp. 1343-1350. J. Nilsen, P. Beiersdorfer, S. R. Elliott, T. W. Phillips, B.
S. A. Pikuz, S. von Goeler, M. Bitter, P. A. Loboda, V. A. Reviews A, Vol. 50, No. 3, 1994, pp. 2143-2149.
Letters, Vol. 59, No. 18, 1987, pp. 2051-2054. Vol. 38, No. 4, 1988, pp. 1797-1804. Data Tables, Vol. 93, 2007, pp. 199-293. Vol. 54, No. 5, 1983, pp. 2188-2197. Philosophy, Pergamon Press, Oxford, Vol. 40, 1979. Scripta, Vol. 79, 2009, pp. 1-4. 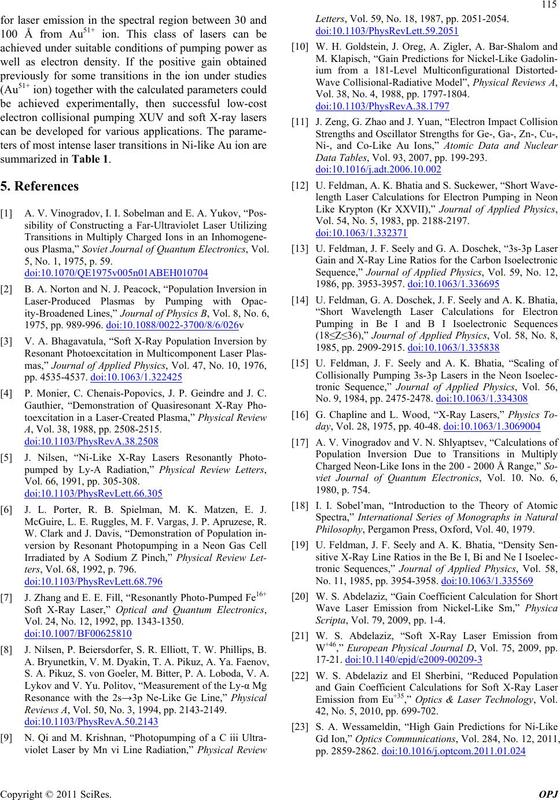 W+46,” European Physical Journal D, Vol. 75, 2009, pp. Emission from Eu+35,” Optics & Laser Technology, Vol. 42, No. 5, 2010, pp. 699-702.